Chop the kumara into equal sized pieces and boil or steam until cooked (around 10-15 minutes). Drain and return to the pan and mash with a fork. Add all the ingredients except the cocoa powder to a food processor and blend to combine to a dough-like consistency. 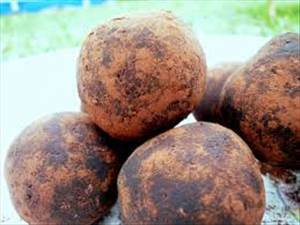 Roll heaped teaspoon sized chunks of the mixture into balls and roll in the cocoa powder to coat. Store in the fridge. 32 members have added this recipe to their cookbook. There are 63 calories in 1 serving of Kumara & Ginger Balls. Calorie Breakdown: 30% fat, 56% carbs, 14% prot.